Homemade spa gifts using edible ingredients are simple and rewarding to make. The special flower-scented sugar scrubs are also unexpected and eye-catching thank to the brilliance of baking sugars. Colors and floral scents can be matched. In a mixing bowl, combine the coconut oil and sugars. Stir together using a sturdy mixing spoon or wooden spoon. If there are larger pieces of solid coconut oil use the back of a wooden spoon to break them apart. Add the flower essential oil and mix fully. 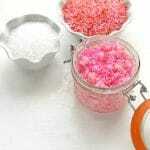 Spoon the sugar scrub into a container, add a final sprinkling of Sparkling Sugar and seal. Note: if the process of blending the coconut oil and sugar has significantly softened the coconut oil, the container may be placed in the refrigerator to allow the mixture to become more solid. Store sealed at room temperature.